Lately, Divine Fits have been playing new songs, performing on late-night television and booking shows (with upcoming Canadian festival appearances at Sled Island and the Squamish Valley Music Festival). 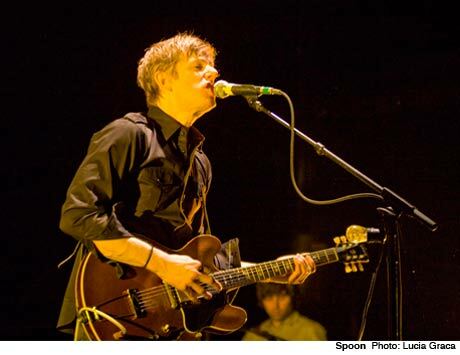 Before we hear a new album from Britt Daniel and Dan Boeckner, however, Daniel will be working on a new album with his long-running band Spoon. Speaking with Spin, Daniel revealed that he and his bandmates worked on some new material last fall, although the forthcoming collection is still in the planning stages. He said, "Right now it's a lot of instrumental music. There were a few tunes that I have written over the last couple of years that I brought in at these rehearsals. And they sounded pretty good, actually. A couple of those, they're — what are they? — they have slightly more soul than the last record, if anything? Slightly more R&B. And then there's these instrumental songs. I don't know how those will end up. I gotta put some words on 'em." As for Divine Fits, he said that the band will "eventually" make a new album, although this will have to wait until Spoon finish their record. In the meantime, Divine Fits have set their sights on a new single, featuring the songs "Chained to Love" and "Ain't That the Way." These were recorded shortly before SXSW, with Boeckner singing the former and Daniel taking the lead on the latter. He speculated that these songs will likely be released digitally with a 7-inch to follow. Listen to a live version of "Chained to Love" below. Photos on the band's Instagram were taken last month at Sunset Sound studio in Los Angeles. There's no word as to what Boeckner will get up to while Daniel is working with Spoon. As you may remember, Handsome Furs broke up, while Wolf Parade are on an indefinite hiatus.